The Chogoria route is our recommended and arguably the most magnificent ascent route to the summit area. It is the driest route up the mountain and the walk beside the Gorges Valley truly spectacular.This trip allows 7 days with time to acclimatize and ascend the mountain in safety. The “Round the Peaks” circuit is justifiably a magnificent tour to complete offering ever new views of the summits, glaciers and tarns with their unique high altitude vegetation. The descent by the Sirimon route takes one through some beautiful forest tracks and completes the traverse of the mountain. Day 1: Nairobi- Mt Kenya Bandas (2,900m) 3 hrs, 10km, 950m ascent. Day 2. 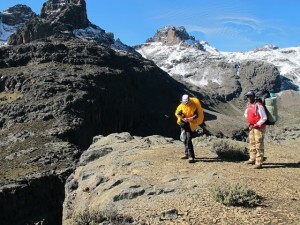 Mt Kenya Bandas – Lake Ellis Campsite ( 3,600m) 3hrs, 9km, 700m ascent. Day 3: Lake Ellis- Minto`s Camp. ( 4,200m) 4 hrs, 12km, 600m ascent. Day 4: Minto`s – Austrian hut (top hut) 4 hrs, 7km, 500m ascent. Today we begin our trek ascending up along the foot of huge rock walls. From the top we`ll have an excellent view of Mt. Kenya. After ascending for a couple of hours you reach Tooth Col. From here you traverse until you reach the Austrian Hut for dinner and overnight. Day 5: Austrian camp – Pt Lenana(4,985m) – Shipton camp. 5 hrs, 285m ascent, 785 descent. Descend to Shipton’s camp via two tarns and the Hausrberg Tarns. Dinner and overnight at the Shiptons camp. After breakfast we begin a 5 hour descent via Mackinder`s valley to the Old Moses camp (3,300m). The descent is gentle and it offers ample time to enjoy fascinating scenery which includes the moorlands before reaching the camp. After early morning breakfast, descend for 3 hours up to the Sirimon Park gate to catch a vehicle for the return journey to Nanyuki. Later transfer back to Nairobi arriving by 1700 Hrs.